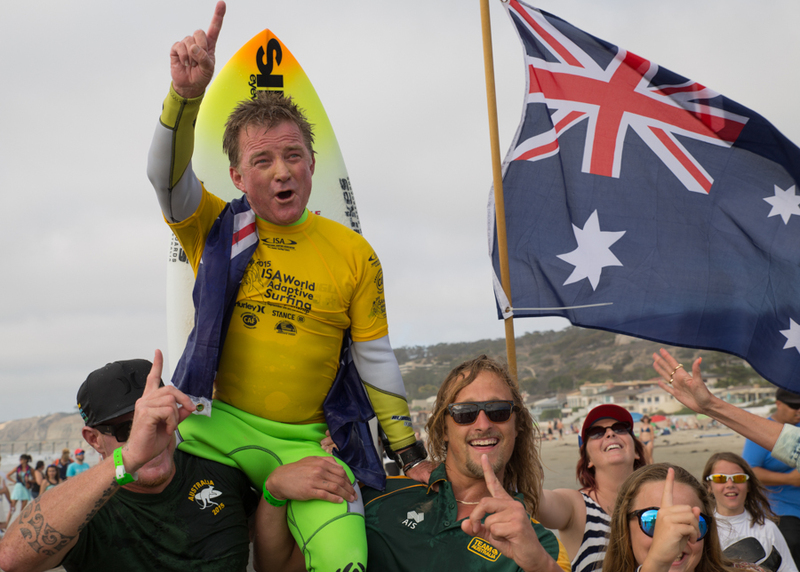 The inaugural ISA World Adaptive Surfing Championship Presented by Challenged Athletes Foundation, Hurley, Stance and the City of San Diego, culminated on Sunday at La Jolla Shores in grand fashion, crowning the first-ever ISA World Adaptive Surfing Champions. Demonstrating the international profile of this ISA World Championship, the Gold Medalists from four continents were greeted by a crowd of thousands. Adaptive surfers from 18 countries cheered them on, showcasing the international support that has been evident throughout the competition. The newly crowned Gold Medalists were Bruno Hansen (DEN) in Prone, Jesse Billauer (USA) in Assist, Mark “Mono” Stewart (AUS) in Stand and Fellipe Lima (BRA) in Upright. The Upright Final was the first of the four Finals to take place, with Brazil’s Fellipe Lima scoring a heat total of 12.93 to earn him the title of the first ISA World Adaptive Surfing Champion. Following Lima were three athletes from the USA: Jeff Munson with Silver, Chris Oberle with Bronze and Freddy Carrillo with Copper. USA’s Jesse Billauer got out to an early lead in the Assist Final that he never lost, earning Gold for the host country. Taking the Silver was fan favorite, 10-year-old Davi Teixeira from Brazil, followed by Juan Martin De Posadas from Uruguay with Bronze and the only female medalist, Darian Haynes from Hawaii with Copper. Billauer emotionally shared words with ISA President Fernando Aguerre after his heat. Bruno Hansen from Denmark put on an impressive performance en route to taking the Gold Medal in Prone. USA Team Captain, Christiaan Bailey, finished with the Silver Medal, Spain’s Alvaro Bayona with Bronze and USA’s Ryan Baker with Copper. The Stand Final wrapped up the event in dramatic fashion. Australia’s Mark “Mono” Stewart narrowly earned the Gold Medal with a heat total of 11.13, edging out South Africa’s Antony Smyth’s score of 10.66. Rounding out the heat were Brazil’s Alcino “Pirata” Neto with Bronze and Hawaii’s Mike Coots with Copper. The 52-year-old Stewart spoke about his accomplishment. “It’s a dream come true. I think everyday I’ve had a tear in my eye seeing people who are so dedicated and love the ocean as much as I do. ISA President Fernando Aguerre spoke after the Closing Ceremony. 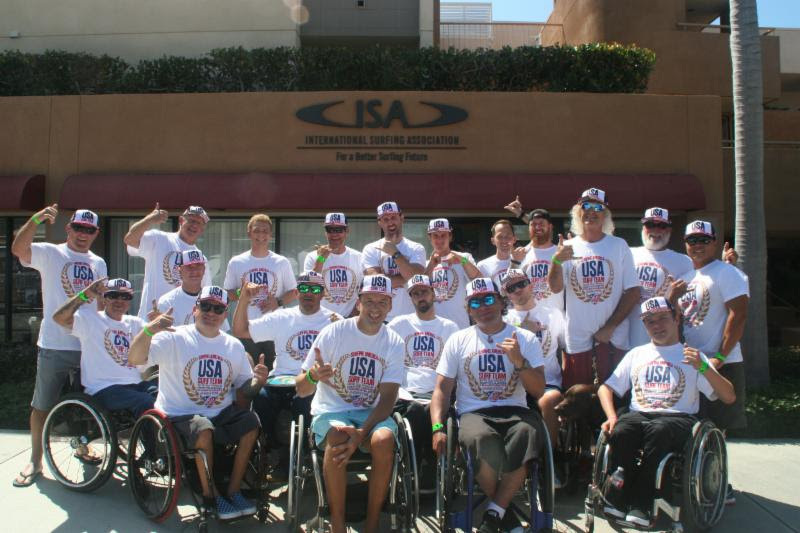 La Jolla, California, September 26, 2015 - On Saturday, September 26th, the global Adaptive Surfing community gathered at the Deni + Jeff Jacobs Challenged Athletes Center in San Diego for the ISA Adaptive Surfing Symposium. The objective was to raise awareness, share best practices, and initiate a conversation about how Surfing can play an ongoing and vital role in enriching the lives of physically challenged athletes. 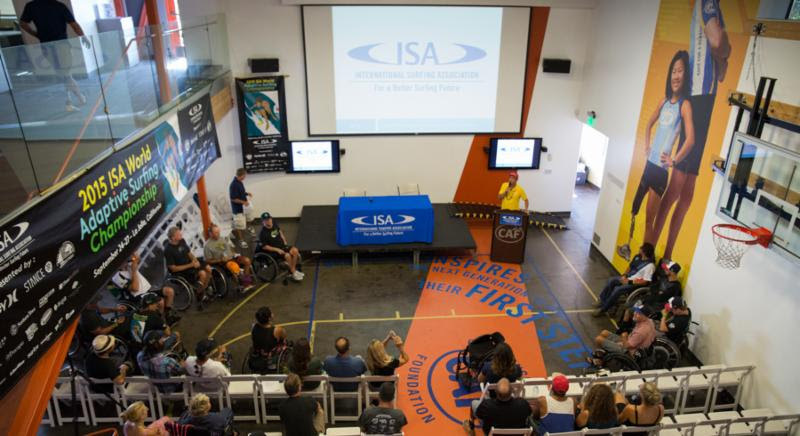 The Symposium goal is to build on the platform created by the inaugural ISA World Adaptive Surfing Championship Presented by Challenged Athletes Foundation, Hurley, Stance and the City of San Diego. The Symposium opened with words from ISA President Fernando Aguerre. "We included the Adaptive Surfing Symposium as a part of this ISA World Championship to build upon this historic moment. In order to make progress in the discipline of Adaptive Surfing, we need to learn, share ideas and create a development pathway for the sport." Following Aguerre's introduction, a panel of adaptive surfers featuring Alana Nichols (USA), Mike Coots (HAW), Dries Millard (RSA), Alcino "Pirata" Neto (BRA) and Ismael Araya (CRI), highlighted the diverse range of physical challenges and backgrounds of the competing athletes. 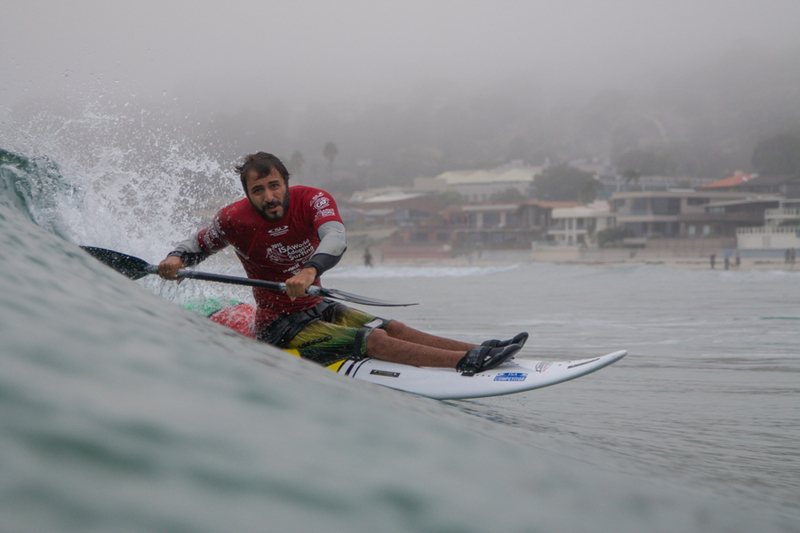 La Jolla, California, September 25, 2015 - Day one of competition of the 2015 International Surfing Association (ISA) World Adaptive Surfing Championship Presented by Challenged Athletes Foundation, Hurley, Stance and the City of San Diego was completed, as the global Adaptive Surfing community united at La Jolla Shores. 69 surfers from 18 countries took to the water, marking the largest international Adaptive Surfing competition of its kind to date. The opening day of competition took place in clean, glassy conditions, as athletes competed for a chance to surf in the Finals on Sunday. Athletes from all four divisions, Stand, Upright, Prone and Assist, made the most of the 2-3 foot waves at La Jolla Shores, executing impressive carves and maneuvers. The stand out surfer of the day was South Africa's Antony Smyth, scoring the highest two wave heat total of 16.77. Smyth, who has paralysis in his right arm, will go on to represent his country in the Finals on Sunday for a chance to win Gold. Lucas Retamales, a blind surfer from Chile, put on an inspiring performance drawing a huge reaction from the crowd. He was able to sense incoming waves and get long rides from deep in the ocean to the beach. Having lost his surfboard in the recent Chilean tsunami, Retamales kept his composure and put on a spectacular effort on a borrowed board. 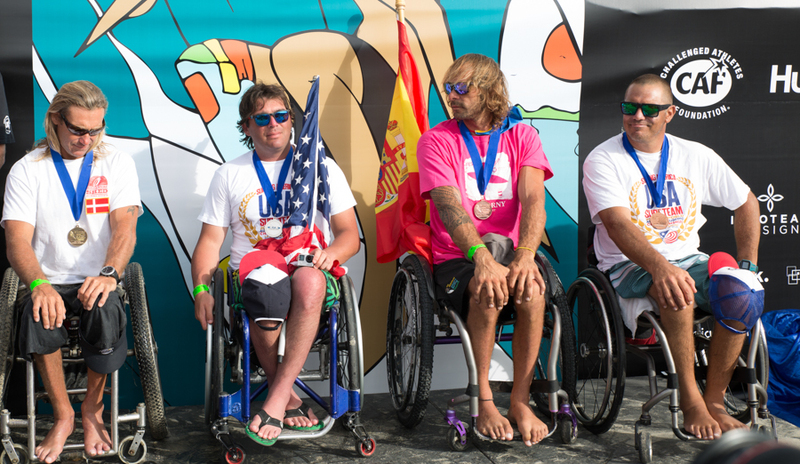 La Jolla, California, September 24, 2015 - The 2015 ISA World Adaptive Surfing Championship Presented by Challenged Athletes Foundation, Hurley, Stance and the City of San Diego was officially inaugurated with the Opening Ceremony in San Diego's iconic Balboa Park, marking the largest international Adaptive Surfing competition of its kind to date. In attendance were 18 National Teams that travelled from around the globe to celebrate this inaugural competition. Influential members of the San Diego community and Surf Industry, such as Mayor Kevin Faulconer and surf legend Rob Machado were also present. The celebration began with the Parade of Nations. Each country carried their national flags while parading through the picturesque walkways of Balboa Park, led by ISA President Fernando Aguerre, ISA Officials and Judges. The Parade ended at the Spreckels Organ Pavilion where the ceremony continued. Mayor Kevin Faulconer welcomed the international athletes to the City of San Diego. "Surf culture is San Diego culture, which makes our city the perfect spot to host the very first ISA Word Adaptive Surfing Championship. Surfers and San Diegans may seem laid-back, but beneath the surface, have the passion and drive to do some incredible things. This competition is about celebrating those who have overcome physical challenges to perform amazing feats in the water. The athletes in the ISA World Adaptive Surfing Championship are proof that physical challenges don't mean physical limitations." 8-year-old surfer, William Thompson, enjoying the waves at La Jolla Shores during the ISA Adaptive Surfing Clinic. La Jolla, California, September 24, 2015 - Thursday morning kicked off the festivities for the 2015 International Surfing Association (ISA) World Adaptive Surfing Championship, with an Adaptive Surfing Clinic at La Jolla Shores in sunny conditions and glassy waves. All type of adaptive surfers gathered at the clinic to receive instruction and display their talents in front of the world's best adaptive surfers. Each participant was provided with a designated instructor to provide him or her with personalized lessons tailored to their skill level. Joining the action at the clinic was Tim Foreman and Chad Butler from the Grammy award winning rock band Switchfoot and Stance athletes Tanner Rozunko and Brian Bent. President of the ISA Fernando Aguerre commented on the success of the ISA Adaptive Surfing Clinic. "This is an amazing way to commence the festivities for this inaugural ISA World Championship. Seeing the smiles on the kids' faces after catching a wave is so inspiring. Some of these kids have never experienced Surfing before; it is incredible to witness the energy and healing power that the ocean provides them." La Jolla, California, September 23, 2015 - A grand total of 69 athletes from 18 countries are confirmed to compete in the inaugural ISA World Adaptive Surfing Championship Presented by Challenged Athletes Foundation, Hurley, Stance and the City of San Diego, which will officially begin on Thursday, September 24. 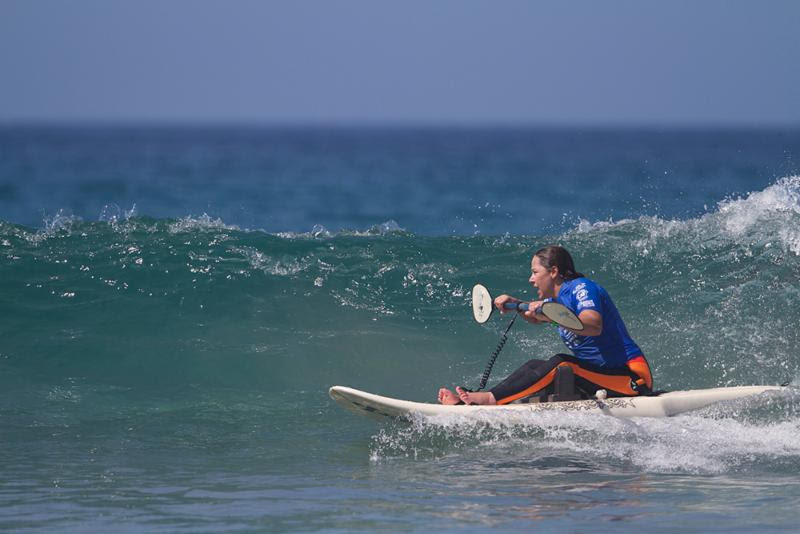 The Adaptive Surfing clinic will kick off the festivities at La Jolla Shores, where young adaptive surfers will receive instruction and have an opportunity to display their skills. 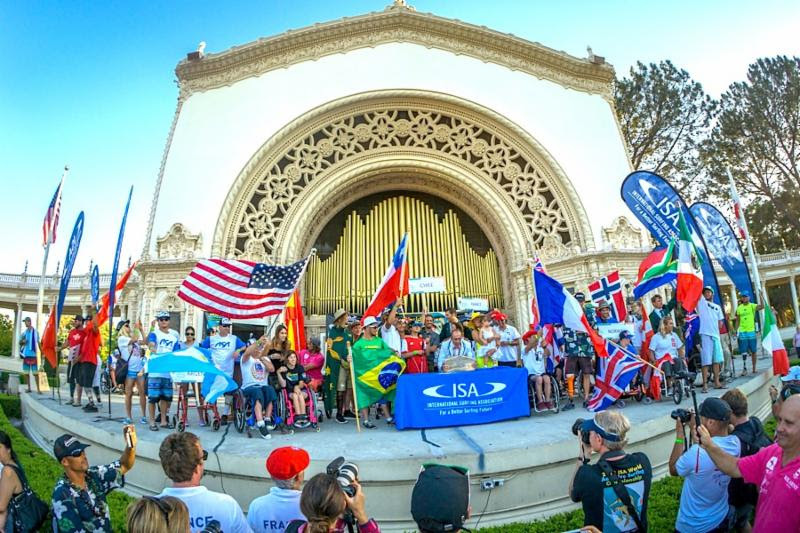 On Thursday afternoon, the official inauguration of the ISA World Championship will take place with the Opening Ceremony starting at 4:15pm at the Spreckels Organ Pavilion in Balboa Park. The 18 International Teams that have confirmed their participation are Argentina, Australia, Brazil, Chile, Costa Rica, Denmark, France, Great Britain, Hawaii, Italy, Mexico, New Zealand, Norway, South Africa, Spain, Switzerland, United States and Uruguay. With 69 international athletes, this ISA World Championship will be the biggest international Adaptive Surfing competition of its kind to date. 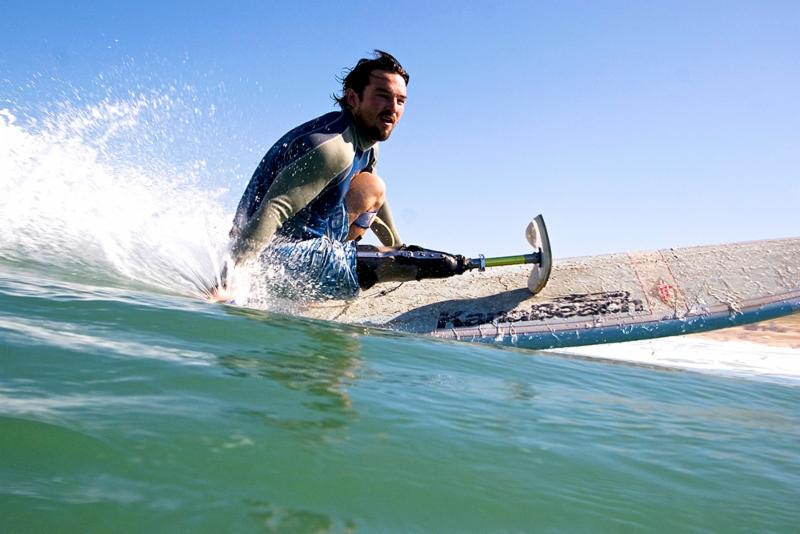 La Jolla, California, September 22, 2015 - From September 24-27, La Jolla, California will be host to the inaugural ISA World Adaptive Surfing Championship Presented by Challenged Athletes Foundation, Hurley, Stance and the City of San Diego. Gathering more than 70 adaptive surfers from 18 countries, this ISA World Championship marks the largest international Adaptive Surfing competition of its kind to date, taking place at the classic Southern California beach break of La Jolla Shores. This inaugural competition will gather the global Adaptive Surfing community to provide surfers with physical challenges with a platform to compete for their country and display their talent with the goal of growing and developing the sport. The competition will feature athletes from 18 countries: Argentina, Australia, Brazil, Chile, Costa Rica, Denmark, France, Great Britain, Hawaii, Italy, Mexico, New Zealand, Norway, South Africa, Spain, Switzerland, Uruguay and USA. Official promo video for the 2015 ISA World Adaptive Surfing Championship. 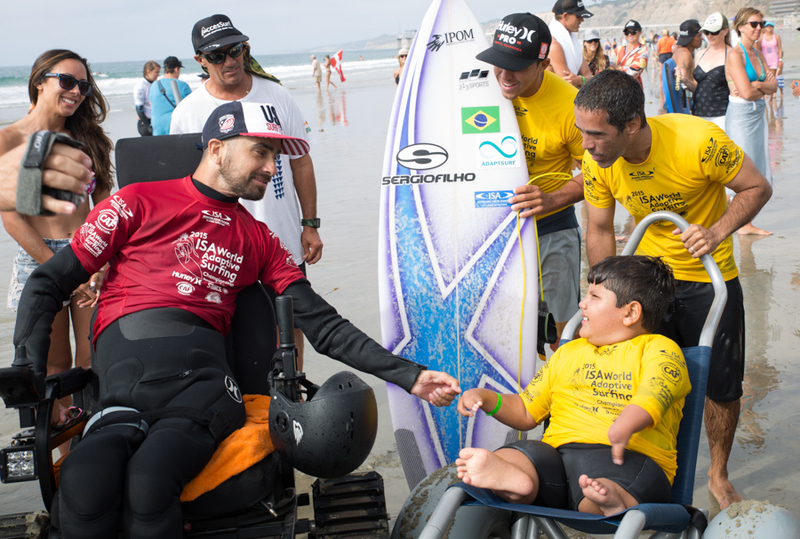 Anticipation is growing for the 2015 ISA World Adaptive Surfing Championship presented by Challenged Athletes Foundation, Hurley, Stance and the City of San Diego. An international field of more than 65 athletes from 17 countries will feature the world’s top adaptive surfers to compete on the sport’s highest stage. Andy Davis, a renowned Southern California surfer and artist, created the art for the official event poster of the 2015 ISA World Adaptive Surfing Championship. Adding to the building momentum of the event, leading sock brand, Stance, recently committed to supporting the World Championship as a presenting sponsor. Founder and CEO of Stance, Jeff Kearl, expressed his excitement of supporting the event. Sunday, Sept. 27 – 8am-5pm: Live webcast of Competition Finals at La Jolla Shores to culminate with the event’s Medal and Closing Ceremony. The International Surfing Association (ISA) is recognized by the International Olympic Committee (IOC) as the World Governing Authority for Surfing, StandUp Paddle (SUP) Surfing and Racing and all other wave riding activities. The ISA has been crowning World Champions in surfing since 1964, with the ultimate mission to develop surfing globally. To learn more, visit www.isasurf.org. The Challenged Athletes Foundation® (CAF) is a world leader in helping people with physical challenges lead active, healthy lifestyles. CAF believes that participation in physical activity at any level increases self-esteem, encourages independence and enhances quality of life. Since 1994, more than $64 million has been raised and over 11,000 funding requests from people with physical challenges in all 50 states and dozens of countries have been satisfied. To learn more, visit challengedathletes.org or call 858-866-0959.